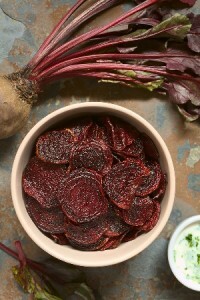 Toss the sliced beets and whole garlic cloves with oil, salt, and paprika. Spread out onto a baking pan and bake until the edges start to curl. This will take 10-20 minutes. Remove from the oven and put the cloves of garlic in a bowl. Mash into a paste. Mix the cream cheese, milk, lime juice, horseradish, onion powder, celery salt, and crushed garlic until well combined and enjoy as a dip.